A coffee shop which opened in Brighton without planning permission has been ordered to stop operating as a cafe. 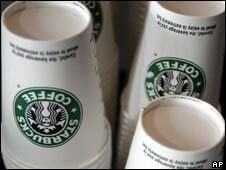 Brighton and Hove City Council said it had served an enforcement notice on the Starbucks store in St James's Street, which takes effect from 9 January. Starbucks will be allowed to sell takeaway coffee and sandwiches, but they cannot be consumed inside. The shop opened in May even though it had not received planning permission to use the site as a cafe or restaurant. Starbucks will have to take out all the seats and tables from the shop. It has been given six weeks to comply, with full compliance with the enforcement notice required by 20 February unless an appeal is received on or before 9 January. The company said it was currently considering the options. "We believe that our coffee houses make positive contributions to their local areas and, in particular, Starbucks store on St James's Street has helped its community by creating around 14 new jobs and by providing a relaxing and safe environment for customers to enjoy great tasting coffee," a statement said. Every weekend since its opening a protest has been held outside the store by campaigners worried that if too many chain stores open in the area rents will increase, making it more difficult for independent retailers. More than 2,000 signatures on a petition were gathered and presented to the council this week. Councillor Lynda Hyde, chairman of the council's planning committee, said: "We are responding to local concerns and making it clear we will not tolerate planning regulations being flouted in this way. "Our planning team has been monitoring the operation and it is clear that sales of food and drink for consumption on the premises form a considerable part of the business, in breach of planning consent."